Two paper bags are shown. There is a 2 foot red rope in one bag and a 2 foot white rope in the other. Snap your fingers and the ropes change places. Snap again and they jump back to where they started. The spectators think you have an extra length of rope in each bag - they are correct! 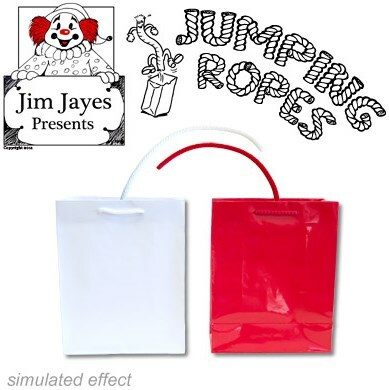 You reach into the bags and bring out two 24 inch, red and white striped ropes, leaving the bags completely empty! Comes complete with 2 paper bags, 4 lenghts of rope and instruction sheet.